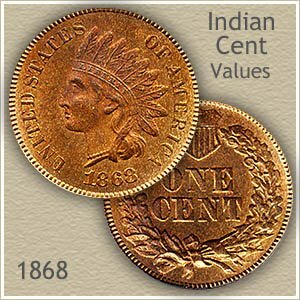 1868 Indian head penny value is above average compared to most old pennies. With the growing popularity of the series those minted in the 1860’s are worth large premiums. If your 1868 penny has avoided the most common "problems" found on old coins the value often doubles. The first to notice is the appearance and overall color, tan to warm brown is natural. Dark and uneven color is less appealing. Another obvious distraction is if the coin is bent, also lowering the value. Inspect for scratches and also for large dents or nicks to the rim. Noticeable heavy abrasions also lower the value of an otherwise nice coin. Collectors of Indian pennies are committed to adding quality to their sets. Nice, original honest coins are in the greatest demand. Coins with "problems" are passed over or discounted. There are coins whose appearance and quality of surfaces place them well above average. Other uncirculated 1868 pennies are known, but within the top gem uncirculated condition class this rare penny is decidedly above average. The consignor who placed the coin in a David Lawrence rare coin auction saw the bidding reach $1256, an above average price. Most uncirculated 1868 pennies are valued in the $200 to $400 range. It's easy to see many above average qualities combined into this one coin. Bold, highly detailed strike, fully detailed feathers. Pleasing bright luster with just the slightest golden toning covers the coin. Normally seen nicks and contact marks are few and light. 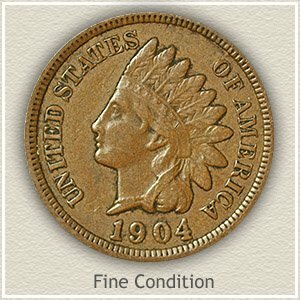 Also possible, when considering your old Indian pennies in circulated grades, some will naturally stand out. Look for those displaying above average qualities. One of the best in terms of eye appeal are examples having toned a light to medium brown in color, a nice look for a circulated coin. Those pennies with very dark toning tend to hide much of the design. By comparing one coin to the next, exceptional qualities are apparent. The market place does reward quality with above average 1868 Indian head penny value. 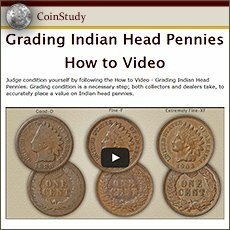 Wear is the leading factor in raising or lowering the value of your Indian penny. 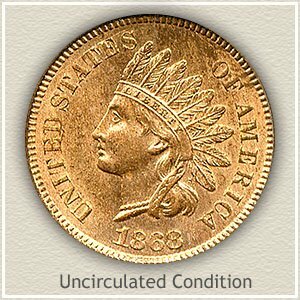 When a collector or dealer is determining value they first "grade" the condition of the coin. 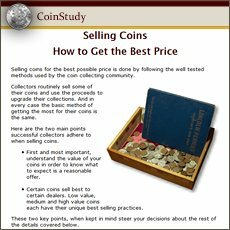 Judge your coin by comparing the images and description and conservatively estimate its grade. Coins without the "problems" detailed above are considered solid for their grade. Uncirculated: Shortly after minting this 1868 penny still in uncirculated condition was put away and never used. The highest parts of the design have not been disturbed by wear. Check the Indian‘s cheek, hair and ribbon below her ear and the tips of the feathers. If there is any wear, these areas show a smoothing to the surface and the original luster is disturbed. 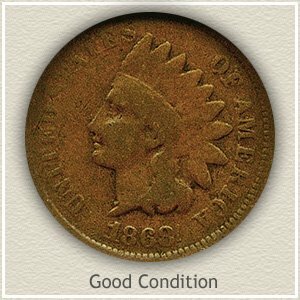 Fine: As a collectible coin, 1868 Indian head penny value in the "fine" grade is generally double a lesser grade example. Moderate wear with ample detail remaining is the appearance of a "fine" condition penny. Wear has reduced the highest details considerably but not to the point of merging one into the other. The ribbon behind her neck is still separated from the hair, although worn smooth as it crosses. Her forehead is fully detailed and distinct from the headband. Further examination of the headband shows despite obvious wear it still portrays "Liberty."